Alex Wong/Getty ImagesUS Attorney General Jeff Sessions. James Wolfe, the former director of security for the Senate Intelligence Committee, has been arrested on charges of lying to the FBI, the US Justice Department announced on Thursday night. Those charges stem from an investigation into leaks of classified information, a DOJ press release said. Wolfe, as part of his role as security director, had access to classified information. He is accused of lying to FBI agents in December about his contacts with three reporters and of making false statements about whether he gave two reporters what the DOJ called “nonpublic information” related to the Senate Intelligence Committee. Attorney General Jeff Sessions previously indicated the government planned to ratchet up its crackdown on internal leaks. James Wolfe, the longtime security director for the Senate Intelligence Committee, has been arrested on charges of lying to the FBI in a case targeting leaks of classified information. The DOJ alleges that Wolfe, in his official capacity in December, lied to FBI agents about his contacts with three reporters and made false statements about whether he gave “nonpublic information” to two reporters, a department press release said. As security director for the Senate Intel Committee for nearly 30 years, Wolfe had access to classified information, according to the DOJ. Wolfe has denied giving classified information to reporters. He is expected to appear in court on Friday. Prosecutors obtained several years’ worth of email and phone data belonging to a New York Times reporter as part of their investigation. That reporter, Ali Watkins, had been in a three-year relationship with Wolfe, The Times reported Thursday night. The newspaper says this is the first publicly known example of the Justice Department obtaining a reporter’s data under President Donald Trump. Attorney General Jeff Sessions previously said the DOJ planned to ratchet up its crackdown on internal leaks, which have been among Trump’s chief complaints since before he took office. During a press conference last year, Sessions said the Justice Department was “reviewing policies affecting media subpoenas,” asserting that reporters’ abilities to disclose information had to be weighed against national security concerns. 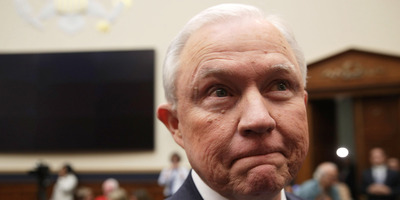 Sessions’ remarks in 2017 earned him some criticism from press-freedom advocates who had been sounding the alarm over the Trump administration’s public hostilities toward reporters and news organisations. A charge of lying to federal law enforcement carries a maximum sentence of five years in prison if a person is convicted.